The medical record is a primary source of communication among health care staff and serves as a permanent record of care and treatment delivered to a patient. Lack of adequate communication and miscommunication can seriously jeopardize patient safety. Many correctional facilities still use a handwritten patient chart, although most traditional settings have moved to electronic documentation. If you are still hand-writing patient care information, here are some tips to improve patient safety in key areas of your documentation. We can get pretty creative with abbreviations when time is short. I have seen some interesting configurations on medical records in the correctional setting. Would you be able to translate “GEE wnl” or “AOB at intake”* Maybe so, if you worked within that particular facility, but, then again, maybe not. What if you needed to interpret the abbreviation in order to provide medication or treatment? “SS per FSBS QD @ 4A”** Would your patient get the right treatment? Inconsistent or confusing abbreviations are risky business. 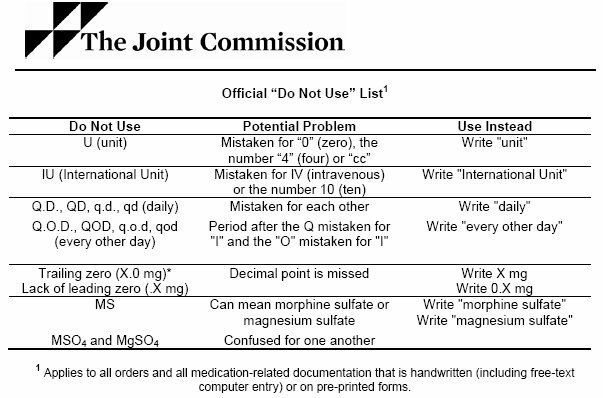 The Joint Commission issued a list of common abbreviations that frequently result in misinterpretation and treatment error. Eliminating use of these abbreviations can significantly improve patient safety at your facility. The Joint Commission short list above is a good start. A longer list of error-prone abbreviations is provided by the Institute for Safe Medical Practices. Consider eliminating their more extensive list of poor abbreviations from your clinical documentation. Loose notes such as sticky notes, post-its, or slips of paper are used to communicate findings among staff members. These may actually start on the chart but then fall out or loosen over time. Always chart communication directly on the medical record. 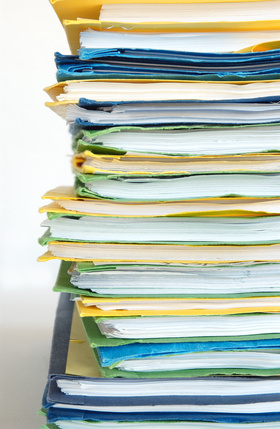 Several medical records exist for the patient and are used by different disciplines. Frequently the patient has both a medical and mental health chart. A complete picture of the patient is difficult to develop without the full chart. Documentation takes place long after care is delivered. When sick call takes place in the housing units or treatment line takes place in a satellite office, documentation may start on scraps of paper or be left to memory for later documentation. A busy day can lead to scattered or absent documentation about important clinical events and observations. In the Checklist Manifesto, surgeon Atul Gawande applies the concept of safety checklists long used in the aeronautic and nuclear power industries to healthcare with exceptional results. Up to a 75% reduction in surgical errors have been attributed to the use of checklists in the operating room. How can we apply this information to the correctional setting? Suggested areas include discharge planning, release from suicide precautions, return from the hospital, and post-emergency documentation. Checklists help us remember important steps in a busy and distracted situation. In some ways, pre-printed forms and flowsheets provide checklist-type prompting to our documentation. Use them whenever possible. What documentation challenges to you see in your setting? Share your thoughts in the comments section of this post. Read more about Patient Safety in Chapter 4 from Essentials of Correctional Nursing. Order your copy directly from the publisher. Use promotional code AF1209 for $15 off and free shipping.